Well worth a winter break, especially if you like bird-watching. We managed a couple of organised trips and finished with a trip total of well over 100. Stayed in the Hotel Senegambia which had fantastic grounds. I guess at least 50 of the trip total came from the gardens. 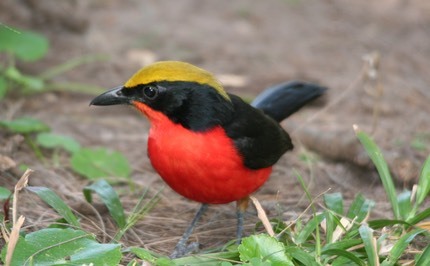 Very knowledgeable guides are easily found & know where the birds are. There is a nature reserve close to the hotel and a guy will take you around for about 3 hours for about £5. Excellent value. Disappointing local food, which looked good but tasted bland. Nice Lebanese restaurants though! Walk in the water on the beach to avoid the hassle. 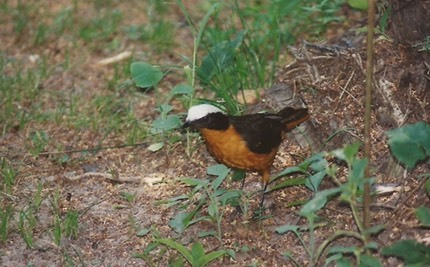 White-Crowned Robin-Chat in the hotel grounds. In the nature reserve the guide was able to find the much rarer Snowy-Capped for me. 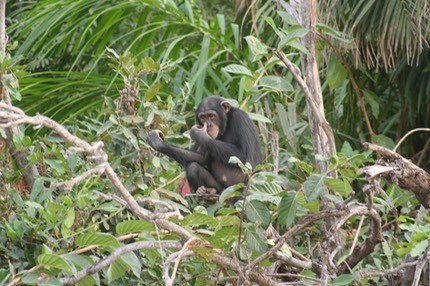 For our return trip to The Gambia we stayed for 1 week in the Karaiba which is right next door to the Senegambia. It has lovely grounds and a good beach frontage. Birdwatching in the grounds was good and a side trip with a local guide gave me a lot of new sightings. The food in town had improved significantly and there were quite a few more bars. 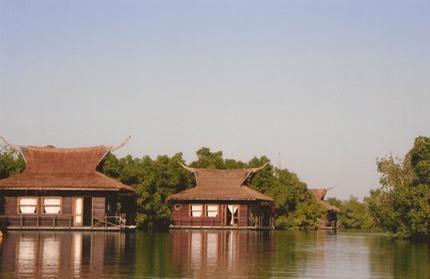 We then moved on to a small eco-lodge in the mangrove swamps which had a large pool, a mix of land and water based lodges, just 7 or 8 in total. Unbelievably news came in that England was under snow and our flight would not be going, so we had a free extra night in the luxury lodge. Our floating bedroom. Winter sunshine only 6 hours away. This was our 3rd trip to the Gambia and we decided to go inland along the Gambia river to see what was worth looking at. The answer was monkeys and birds. Here are a few pics from this trip. 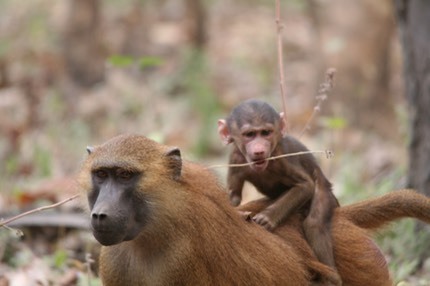 A female baboon with her young. 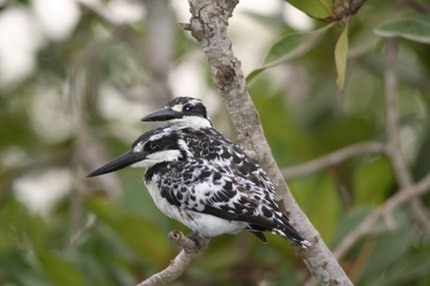 Pied Kingfishers seen on a boat trip to the egret roost where you can see thousands of birds fly in at sunset to roost on a small island. Stunning. 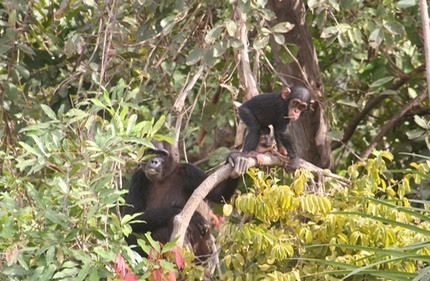 Chimpanzees living wild on 3 islands in the river gambia national park. 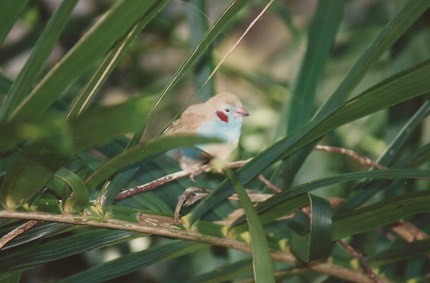 Remarkably tame in the hotel grounds, a yellow-crowned gonalek. We dropped a couple of peeps off to cross by ferry into Senegal. 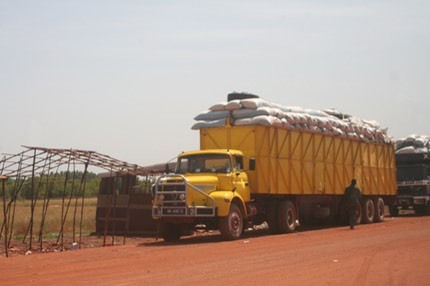 There was a long line of lorries and I asked our driver how long they would have to wait to cross. Is it hours?. He said on a good day it is 3 days to wait but it could be 7 days in the busy season. Wow…..